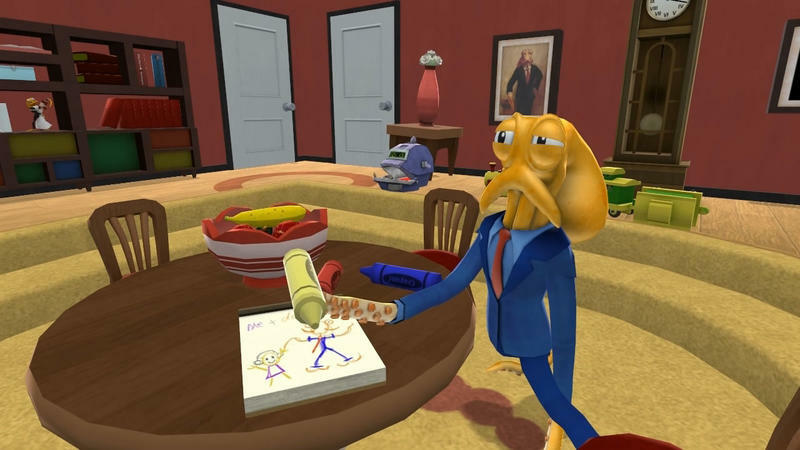 In Octodad: Dadliest Catch, the sequel from Young Horses’ free student project called Octodad, players are tasked with living the life of a father of two and husband to one. Sounds simple, right? Hold on. You play an octopus. No one else knows you’re an octopus. 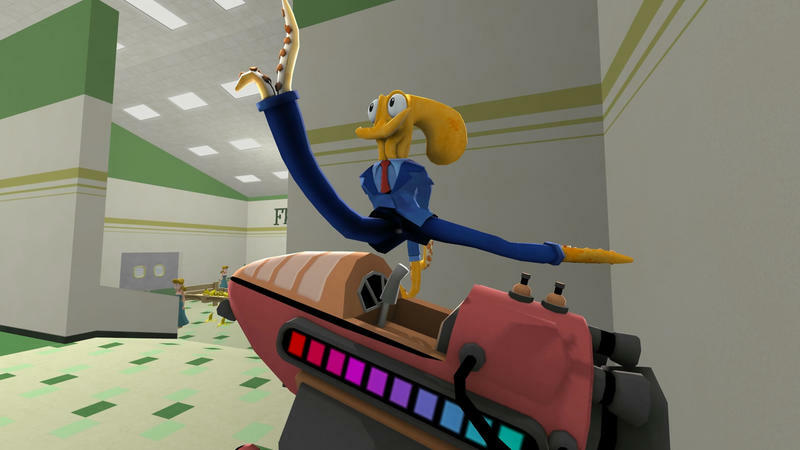 Octodad has to go about his daily life without raising too much suspicion. If his human wife and human children ever figure out Octodad’s secret, it’s game over. The fun comes when the ridiculous plot meets this game’s awe-inspiring control mechanics. Here we go. Now, I imagine living in the ocean and using tentacles and suction cups to explore might be quite grand for the invertebrates of the sea. Jellyfish, squid and octopi all have it good when it comes to living bonelessly beneath the waves. Every limb is handled separately. When you walk, you use the left mouse button to lift your lower left tentacle, and the right mouse button to lift the right tentacle. With one “leg” up, you push the mouse in the direction you want to move. Repeat again and again to walk. When it comes time to manipulate objects in this virtual space, like putting on a bowtie, you click the middle mouse button to switch to your top limbs. Then you control them in a similar fashion. The whole thing comes together in a way that’s both challenging and absolutely absurd. In the PAX East demo, which is almost identical to the gameplay clip at the head of this post, players assume the role of Octodad as he’s having a flashback to his wedding day. Now, consider the aforementioned mechanics in addition to this game’s premise. You want to navigate the space with enough confidence and finesse so that your future spouse doesn’t notice that you’re an octopus. The resulting combination is hysterical. I laughed throughout my entire time with the demo. Even better, players gaming around me were laughing just as hard. Octodad: Dadliest Catch is currently set to release in late 2013. One of the developers at the booth told me that a January 2014 launch date might be in the forecast. The game will sell for the PC, Mac and Linux platforms.